Do you enjoy back-country adventures, an active outdoor lifestyle, off-pavement exploring or boondocking? Are you looking for the perfect, budget friendly way to transport everything needed for your next adventure? If you answered yes, the soon to be released family of Dinoot Trailers will definitely interest you. We take a different approach than most to equipping folks for Trailer Supported Adventuring. At the heart of it is a modular collection of Lego™ like fiberglass components configurable to meet a wide range of needs. By putting in a little sweat equity, we will offer a budget friendly, "have it your way" approach to building your perfect trailer. Our planned family of trailers is designed to work great as both Gear Haulers and Tent Topped Camping Trailers. Ive got an airstream and would not normally consider a very light trailer BUT it seems like you can offer me all the benefit of a little cargo trailer for racing and a small teardrop all in one but even lighter. Neat idea. Love the cargo ability. I get the feeling I could make something like this really work for me. Thanks, sounds like the hardsided model we have planned might work nicely for you. Here is a sketch and very early prototype. Gosh thats about PERFECT for me. I could easily outfit it for camping and yank that gear for racing AND BE ABLE TO LOCK UP MY GEAR not have it in an open trailer with a bunch of chain and locks. Keep up the good work. Looking forward to pricing. Man that looks like it would be fun. But it'd be really hard to convince the wife to sell the 33' TT. 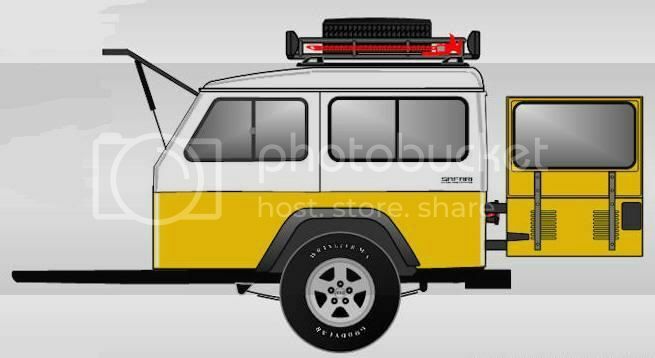 LosAngelesLGT, yes it will be easy to make the hardsided camper multi-purpose. For security, I also have hard covers in the works for the tub kits. You can sign up on the web-site for email updates, to get the latest info like when pricing is available. jb_3.6r, keep your wife happy with the 33' TT and build a Compact for those over night trips fishing or ?? with the guys. I do dig the tire trailer but I have a feeling it is going to be priced out of my budget for a single use trailer. For a bit more the hardsided one might be just perfect for me though!!! Here is a sketch of what the prototype Tent Topped version above would like look with matching rims and paint. This is actually built by Living Lite RV - and sold By JEEP. There are lots of these being built now days. Multi use trailers found here... And being multi use is why I bought one. This one is built by Life time Products which makes lots of stuff they also make the highly respected Jumping Jack trailer. Tent Trailers - From Trailer to Tent in 5 Minutes! Where you find quality in these small trailers is in the tent material and the trailer structure.